Every coffee drinker likes his coffee hot, but not every coffee maker has a thermal carafe, and the only way to keep the coffee hot is to keep the coffee maker turned on for hours. Maybe you don’t want that, and there are accessible solutions for this situation. We’ve put together some of the best thermal carafes below to make it easy for you to find the one that best suits you. Further we’ll go into details about our favorites. If you want to keep your coffee hot for hours, the best thing you can do is transfer it to the thermal carafe immediately after it’s brewed. This way you can enjoy a hot cup of coffee even later in the day. Most carafes retain the heat long enough, so you don’t have to worry about that. The difference that you see in the comparison chart is very relative. You should be expecting your beverage to lose heat as time passes, but it’s hard to feel a difference of a few degrees. Further we’re going into details about the ones we liked most. Actually this is more than just a thermal carafe. It’s a thermal french press. You can brew coffee or tea directly in this carafe, and because it was specially designed, it will keep your coffee hot for hours. It’s fast and easy to use and saves a lot of space. 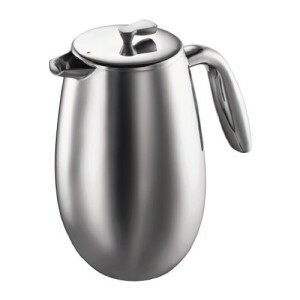 It’s made of polished stainless steel, featuring a comfortable handle. It’s also dishwasher safe, so you don’t have to waste time cleaning it. The lid on top can close hermetically preventing liquids from spilling or heat from escaping from the carafe. It comes with a measuring spoon and an instruction manual that is easy to understand. Most of the coffee drinkers who also bought this product think that it does great what it’s supposed to do and that it was well worth the price. 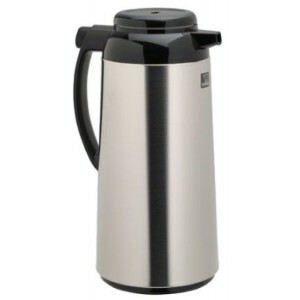 This thermal carafe from Zojirushi is a perfect choice if you work in an office with colleagues and need bigger amounts of coffee. 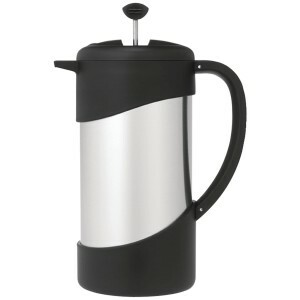 It has a swivel base, and a push button open/close lid, which is fantastic and makes this carafe really easy and comfortable to use. The handle is designed in such a way that you can comfortably transport it without getting burned. The coffee will remain hot in this carafe for hours thanks to the construction of the container. It will probably lose 2 degrees every hour, but when you pour yourself a cup in the afternoon you will hardly notice the difference. A useful tip: it will keep a full pot hot for more time than two cups, for example. 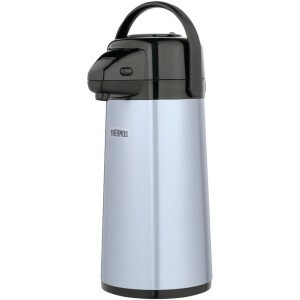 This thermal carafe from BUNN is the one that has the largest capacity from those that made it to our comparison chart, namely 72 oz. It has a push button technology, which will release up to 4 oz. at the first pump. It’s made of stainless steel, has a chrome finish and a black trim. The glass insulation keeps your coffee hot for hours. This is the perfect choice, if you like to explore the outdoors with family and friends, because, as you will notice too, it’s rather tall and big. It’s not the most comfortable thermal carafe to take to work, but then again, it depends on the reasons why you’re looking for one in the first place. These are our choices for the best thermal carafes on the market. The perfect choice for you is relative to the needs you have, but you can’t go wrong with either of the ones that we presented.